Writer, Poet, Lover, Visionary, Entrepreneur, Level 5 Leader, Consultant, Scientist, Engineer, Designer, Project Manager, Yogi, Student, etc. "The Mettatations - business bio:" Steven has been studying and practicing positive psychology since 2002 when he read Martin Seligman’s Learned Optimism. A former systems engineering scientist with Bayer and a lifelong learner, when he started meditating in 2011 he immediately saw the parallels between meditating and the history of positive psychology and how the two could be integrated. Steven then began developing positive meditations – Mettâtations – where he actively cultivated positive thoughts, emotions, and energy based on the positive psychology research. Through his own yoga practice, he recognized the trapped negative energy in his own body and how it could be accessed and healed while moving and mettatating. Movement and ‘yoga’ were then integrated into Mettâtation practices. The power of touch, and the power of pranic breathwork were then recognized intuitively as complementary entry points and energy pathways that could help enhance Mettatations. Touch and pranic breathwork have become cornerstones of the developed Mettâtation practices. The integration of these six practices into new practices creates powerful positive practice where you can directly and actively cultivate positive thoughts, emotions, and energy which can be applied in everyday life. As Rick Hanson and many others have shown, new positive neural pathways are created in your brain when you have regular positive practices. Another essential scientific finding is that 'it's now what happens to you that is most important psychologically, but how you interpret and think about what has happened to you that can make all of the difference in your life." Having gone through some very difficutlt circumstances in his life, including 2 major battles with Depression, Steven has had his dark knight of the soul experiences. He knows first hand what they are like and more importantly how to get out of them, and now how to prevent them. And he is excited to share his discovery and developed practices with you. 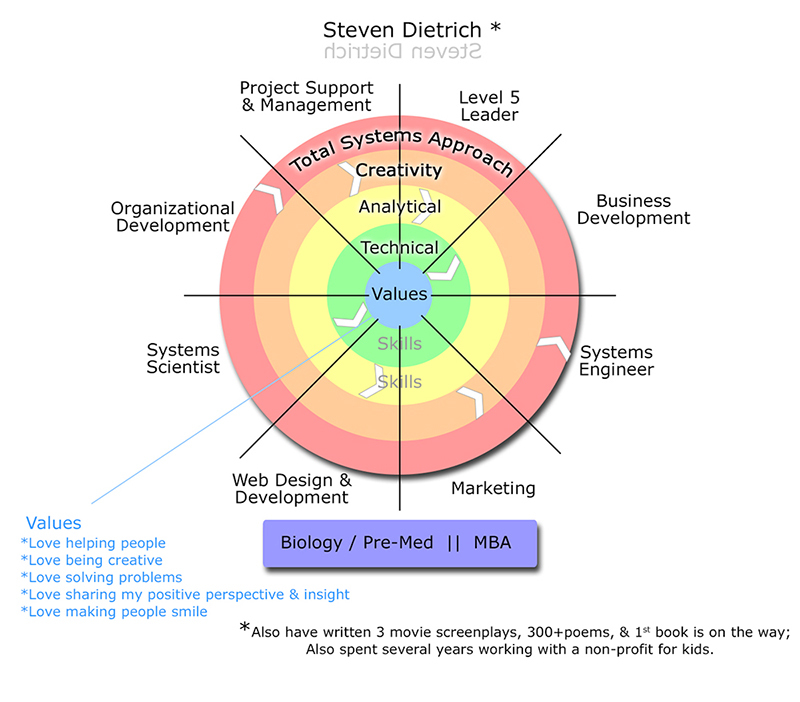 Steven Dietrich holds a Bachelor’s degree in Biology, having gone through the pre-med program, and a Master’s in Business Administration focusing on Organizational Development and Change while attending graduate school. He worked for several years as a Systems Engineering Scientist at Bayer Diagnostics helping to design and develop the Advia:Centaur blood analyzer. His job was to integrate different engineering disciplines to create a robust system that worked with blood samples and chemical reagents. His job was to integrate, to evalute, and to create. Steven is also a poet and writer, having completed 3 ½ movie scripts, few hundred poems, and a couple of books on the way (see StoryBender). 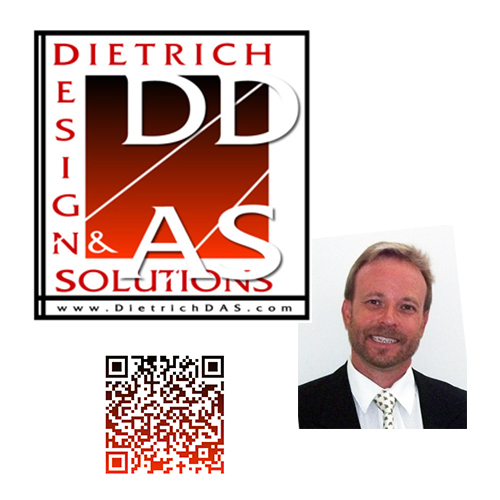 He is also a small business and non-profit consultant, and a website developer @Dietrich Designs And Solutions (DietrichDAS.com). Steve’s passion is discovering new ideas and concepts to help people learn to have happier, healthier lives. 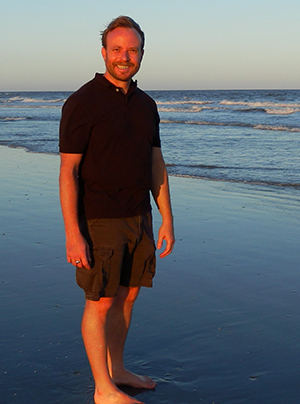 Steve has been studying Positive Psychology and Buddhism, practicing Yoga, Meditation, and for many years. The combination of these practices and influences into one single practice - Mettâtations was a natural discovery for Steve. From his teens on he has always had the ability to connect to a higher source, to see things in different ways, to discover synergies, and to integrate diverse information into creative ideas, designs, and solutions. The discovery and development of Mettatations was one of these processes, seeing the parallel between Positive Psychology and Meditation, and then adding in the layers of Touch, Movement, Yoga, and Breath work. Steve was a Systems Engineering Scientist for several years where he had to incorporate cross-functional areas into one complete total sysem. Mettatations came together in a similar way, listening to and incorporating in the messages from Positive Psychology, Spiritual and Meditation Teachers, Self-help books, all leading to the discovery and development of the foundational elements and fundamentals of the Mettatation practices. Steve's earliest connection started at the age of 16, just a few weeks before his father's death, with poetry coming to him out of 'nowhere.' Since that time he has learned and developed his skill to connect and listen and to let things flow into and through him. Steve has written hundreds of poems, a few movie screenplays (with another 25 waiting), is currently writing 2 books, created art, websites, and much more. In the last couple of years this connection has also been discovered in the kitchen, making many unique meals from seemingly different combinations of ingredients. Steve discovered and started the development of Mettatations in 2014 and recorded the first Mettâtation in July 2014, after many years of listening, research, and practice. Steve's background is in Science, holding a Bachelor's degree in Biology (Pre-Med Program) and also his MBA. He worked for several years as a Systems Engineering Scientist for Bayer before becoming a Small Business and Non-Profit Consultant - Dietrich Designs And Solutions. Psychology has always been one of Steve's callings and interests. Steve loves to help people and to solve problems. With Mettatations, Steve can do both. Discover a different side of Steve on his resume website. "The 'personal/spiritual' bio:" On the morning of Thursday, December 12, 1985, Steven's father died of a massive heart attack at the age of 41. Steve was 16 and it was the opening night of his first high school play. He had a leading role. He went on to perform that night. Within the week, Steven, at age 16 learned that not only had his dad died of a heart attack at age 41, but his grandfather died of a massive heart attack at age 43, and later he learned that his great-grandfather also died of a massive heart attack at age 43. Heredity is the greatest predictor of heart disease. 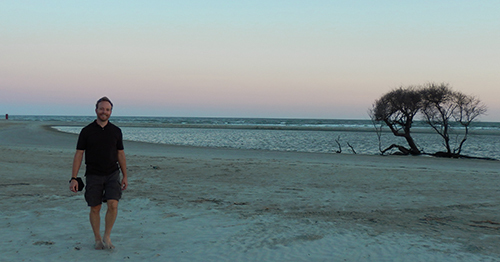 To say that Steven's view of the world changed at 16 would be a huge understatement. Steven saw the world differently from that point on... not only because of his father's death, but his family also fell apart after it. As you might imagine there were some very good and very bad things that came from this paradigm shift. The bad part was the fatalistic view, and the fact that no matter what he did/does at any moment, it could happen to him too. That dark shadow hung over him for a long time and made him a prime candidate for depression. Learned helplessness and the lack of control and hope are key primers for severe depression. Steven experienced his first severe depression while at Bayer around 1998. His second journey into and through depression occurred around 2002. And his last and worst journey into and through depression occurred in 2003. Learning about positive psychology in 2002 very well saved his life. And for the last 14 years he has been a constant student reading, watching, practicing. The positive side of the story is Steve's intuition. The first significant episode came just weeks before his dad died when he 'heard' his first poem. Since then there has been an endless list of intuitive moments both professionally and personally. He has received over 300 poems, a few books, and about 35 movie stories over the years. In 2002, Steven wrote a movie about the election of the first black american president, six years before Obama's campaign. You can read the script and see that most of what happened in the script, later happened in real life. And coincidence or not, Steven and President Obama are both born on the same day, August 4th, but 8 years apart.